Clinton has the party machine locked up. So Sanders's supporters will need to overwhelm the establishment and swamp the polls. Brooklyn—Over the past week I’ve traveled the length of New York state, from Albany to Buffalo, and Poughkeepsie to Park Slope, and came away with two certainties: Donald Trump is going to win his home state in a walk, while the winner in the Democratic primary really depends on which New York shows up at the polls. As the world capital of capital, New York has plenty of places where the 2008 crash was barely a wobble. Chappaqua, where the median price of a house is over $1 million—the Clintons’ place on Old House Lane, purchased for $1.7 million in 1999, is a little larger than the local average—is one, but there are oases of comfort many miles from the familiar canyons of Manhattan or the dunes of Eastern Long Island. There are also the up-and-coming neighborhoods—not just the obvious hipster havens like Williamsburg or Bedford-Stuyvesant or Beacon in the Hudson valley, but Allentown and Elmwood Village in Buffalo, or Saratoga Springs—basically any place capable of supporting a micro-brewery. Then there are the vast expanses of the state where times got hard and stayed that way. Where you drive through mile after mile of toothless blocks searching in vain for an ATM or a bodega, let alone a decent supermarket or a bank that might actually make mortgage loans. Towns that still haven’t replaced the roads and bridges wiped out by Irene five years ago. Where the school districts barely scrape by—or don’t, despite cutting music lessons, and gym class, and field trips, and have to consolidate with the next town. Places where you can end up driving 50 miles to get a broken leg set or a cut sewn up. When Donald Trump speaks tonight in Buffalo he’ll be in the center of the city’s shiny new Canal-side development, across the street from a statue of Sabres hockey great Tim Horton. But if you walk 15 minutes past the empty storefronts up Main Street to the Tim Horton’s donut shop, the management enforces a 20-minute time limit to keep drug dealers and the local unemployed from settling in for the day. And though younger black voters are more inclined to share Sanders’s frustration—and to see the Clintons as complicit in the system that blocks change—their parents, says Greer, are likely to feel that Sanders is shouting about things they already knew long ago. “On the other hand, Sanders showed he was willing to listen to Black Lives Matter—and to change the way he talked about race. Clinton just doubled down. So if those young activists are registered to vote, she may be in trouble,” said Greer. A similar generational split is visible among feminists and gay-rights activists—both of whom are longtime bulwarks of Clinton’s support. Last Wednesday, Tom Duane, the second openly gay elected official in the state and a hero in the fight against AIDS, spoke up for Sanders at the rally in Washington Square—to cheers from the young LGBTQ activists in the crowd, who, as Duane said, were “too young to remember civil partnerships.” But even Clinton’s whitewashing of Nancy Reagan’s record on AIDS has done little to shake her support from established groups like the Human Rights Campaign. I spent Saturday with Zephyr Teachout, the activist and law professor who challenged Governor Andrew Cuomo in the 2014 Democratic primary—and got over a third of the vote, winning much of the Hudson Valley. Which just happens to be the center of the 19th Congressional District, where she’s now the favored candidate to win the nomination for an open seat. Teachout is a Catherine wheel of ideas—in the course of the day we talked about anti-trust, fracking, the desperate need for broadband in rural communities, the way Big Ag gobbles up subsidies meant for family farmers, and the “chickenization” of production that puts all the economic risk and environmental damage on farmers as firms like Tyson keep squeezing the market. Teachout endorsed Sanders before she even declared her own candidacy—and last week he included her, along with Lucy Flores of Nevada and Pramila Jayapal of Washington, in a joint fundraising appeal to his donors. We ended the day at a Planned Parenthood fundraiser in Hyde Park. Trish Prunty, who organized the event, told me that, while officially the group was “all in for Hillary,” there were plenty of Sanders supporters in her organization as well. And it was obvious that Teachout’s backing for the Vermonter hadn’t dented her popularity with the group. But then feminists may be more forgiving than organization Democrats. We’d started the day at the Democratic Rural Conference—a gathering of party and elected officials that, at the last minute, found itself playing host to Bill Clinton, whose surprise appearance ate up most of the time allotted to candidate forums. No one complained—partly out of genuine deference and affection for the former president, who remains popular in New York. And partly, no doubt, out of fear of the governor, whose vindictive streak is legendary. Yet, on his own turf, Cuomo can also be charming, and his warmup speech, in which the governor recounted the many lessons he’d learned “at Mario Cuomo University and Clinton University” was loose, heartfelt, and often funny. The lesson, though, was sober: “The question is not what we want to do. It’s who can get it done.” Cuomo’s extended riff on not just the necessity for compromise, but the heroics of compromise was both an effective setup for Bill’s pitch for Hillary—and a convenient rationalization for every sordid deal he’s ever made in his own career. “I waited until Clinton left the building before I put this on,” Jane Dodds, the DRC’s vice chair, told me as she fastened her Bernie button. That was probably prudent. On Monday, several of the unions who have been providing the funding for New York’s Working Families Party—which, under enormous pressure, declined to endorse Teachout in 2014, but did endorse Sanders, and has been setting up campaign offices for him across the state—announced that they were withdrawing their support. On the Democratic side, New York is going to be close. And as we’ve seen time and again in this race, when things get close, they also get ugly. The brawl in the Brooklyn Navy Yard on Thursday was just the tip of the iceberg. This is a fight that is still very much going on—not just in political clubs and union halls but in church pews and basketball courts, across park benches and kitchen tables. Walking back down 9th Street after yesterday’s big rally in Prospect Park, I saw a brownstone with both Sanders and Clinton signs in the window. “That’s my house, too,” said Jim, an artist who’d come along with my friends—a couple who are also probably going to split their vote. The Sanders crowd in Brooklyn was indeed HUGE. But it was also still strikingly white—at least among those of voting age. The kids represented a wider spectrum of colors. And though Bernie’s speech hardly changed from the versions I’d just heard in Buffalo, Rochester, Syracuse, and Manhattan, the Brooklyn crowd did have a few surprises, like the knot of Hasidim in full black I saw standing next to a lesbian in a green T-shirt with Arabic lettering. 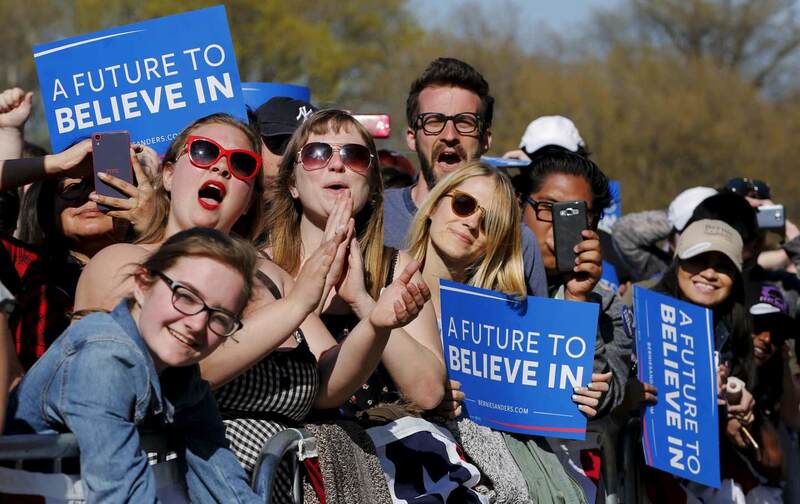 “We’re from Hasidim for Bernie,” said a young man holding a “Feel the Bern” sign. “I’m a Satmar, but we also have Bobovers and Ger Hassidim in our group,” he said. I asked him how they managed to find common ground in the Sanders campaign. New York’s Democratic establishment is subtler than in some places. Instead of suppressing voters, here they just discourage them—by making you vote out four times between now and November. Historically, that has meant reliably low turnout in New York’s primaries—which is just how the organization likes it. If that happens on Tuesday—if the party machine gets out its vote (which is the whole function of a party machine), and the unions who cut off the WFP get out their vote, and only dyed-in-the-wool Democrats troop to the polls, Hillary Clinton will win in a walk. Any other result will take a miracle—especially since the same WFP members who have been working so hard for Sanders won’t be allowed to vote in the Democratic primary unless they changed parties last October. Even coming close here would represent a moral victory. But if Sanders wants to be president, his supporters in New York are going to have to deliver more than another moral victory. They’re going to have to overwhelm the establishment, and swamp the polls in unprecedented numbers. If that happens tomorrow night—if you see HUGE lines in every part of the state—that really might be the beginning of a political revolution.